Road map showing the Florida Turnpike, its toll plazas, exits and service stations. The brochure was produced in 1964. Construction for the Florida Turnpike began on July 4, 1955 in response to unprecedented growth in population and tourism in Florida. Thomas B. Manuel, chairman of the Florida State Turnpike Authority and the "Father of the Turnpike," led planning and construction. The highway opened on January 25, 1957. Original map, 1964: Florida State Turnpike Authority: Fort Lauderdale, Florida: Private Collection of Thomas Cook. 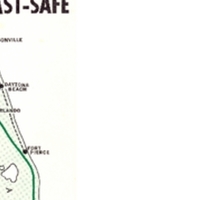 Digital reproduction of original map, 1964: Florida State Turnpike Authority: Fort Lauderdale, Florida. Originally published by Florida State Turnpike Authority. Copyright to this resource is held by Florida State Turnpike Authority and is provided here by RICHES of Central Florida for educational purposes only. "Florida's Turnpike: Providing Transportation Alternatives for 55 Years!" Florida's Turnpike Enterprise. http://www.floridasturnpike.com/about_history.cfm. THE SUNSHINE STATE PARKWAY is the third largest TURNPIKE in the U.S. REMEMBER TO FASTEN YOUR SEAT BELTS! Don not bend, mutilate or lose toll ticket. The seven restaurant facilities on the Parkway are operated by the HOT SHOPPES, INC. Map shows which GASOLINE BRANDS are available at each service area. U-TURNS on the parkway are prohibited. If you have gone past your exit, continue to the next exit or to service area. A restaurant or service station attendant will handle a U-Turn at service area. Illegal U-Turns on parkway can be deadly. The Highway Patrol issues summons for illegal U-Turns. HITCHHIKING is expressly forbidden. PICKING UP HITCHHIKERS can be fatal. If stranded, wait in car for assistance. Do not attempt to hitch rides or flag parkway traffic for assistance. THE AUTHORITY OFFERS CONVENIENT CHARGE ACCOUNTS TO COMMUTERS AND COMMERCIAL AGENCIES. Tolls & Collectors C.E. Barner, Jr. THE AUTHORITY WELCOMES--AND ACTS UPON--ALL COMPLAINTS. FIRST: Get off pavement and on shoulder, not the median strip. SECOND: Raise hood or trunk lid or tie white cloth to aerial. Do no flag traffic. These distress signals alert Turnpike personnel and fellow motorists of your trouble and ask them to report need for assistance, A radio-dispatched vehicle will be en route within minutes. Help your fellow motorists by reporting distressed patrons . . . . Tell toll collector, service station attendant or a Highway Patrolman. YOU MAY MAKE YOUR OWN REPAIRS, BUT BE CERTAIN YOU AND YOUR VEHICLE ARE CLEAR OF THE PAVEMENT. DIMMED LIGHTS when approaching toll plaza help the collector serve you better. Have exact fare ready for collector when possible. Fares are shown on the toll ticket. Passenger cars are Class One. An additional charge is made for utility and boat trailers (Class Six). TOTAL PARKWAY LENGTH IS 265 MILES. TOTAL PASSENGER CAR TOLL IS $4.80. “Florida's Turnpike Map, 1964.” RICHES of Central Florida accessed April 22, 2019, https://richesmi.cah.ucf.edu/omeka/items/show/1383.